There’s an iconic scene from movies and tv shows: some force is threatening a group of people and a hero holds back the danger to save the day. Sometimes is a superhero show and there is something threatening the entire world. Sometimes is a spy show, mystery or drama, and there’s something threatening a small group of folks, members of a team trying to solve a puzzle. It’s even in military shows where a city or community or nation are threatened. But whatever the type of story, some character steps up to a leadership role and holds back the threatening force while others pass through unharmed or while someone else eliminates the threat altogether. In other words, it’s this scene where someone becomes a hero by stepping in the gap between the threat and the threatened, between predator and its prey, between good and bad or strong and weak…you get the idea. And by stepping in the gap, this hero leads people to safety, or buys just enough time to solve a problem or somehow save the day. This theme doesn’t just show up in movies and books and television. It is found all through scripture as well. Moses, Esther, David, Jesus, Paul, Barnabas…pick a story and read it. Many of the big stories of the Bible are about judges or prophets or leaders who stand in the gap for others. Today, I want to look at a specific story of standing in the gap. It comes from a book that we don’t often don’t read, the book of Joshua. And it comes during a time in the story of Israel that we often skip. You probably know the Exodus story. Moses and the plagues and crossing the Red Sea. And you probably know about the 40 year journey in the wilderness – the manna and quail and so on. And you may know about Moses dying before the end of their journey just before they enter the promised land. And you may know a few other details of the Exodus and entry into the promised land. It is one of the most important narrative arcs in all of the Bible. And it’s the paradigmatic story for Jewish people. Before we go on, we know whatever is about to happen is pretty important. It will elevate Joshua into a Moses-like status. So it’s a pretty important day for this Joshua character. Now, we know that parts of the Jordan are shallow and just a trickle of water at the dry seasons of the year. But geographically where the Israelites are right now is not one of those spots nor is it the dry time of year. So standing still in the Jordan right here is already raising some questions. Joshua may just be thinking, “How in the world am I gonna stand still in the water that is over my head and rushing by. Not gonna happen!” It’s like trying to stand still the middle of the Cape Fear river. Impossible! Joshua then said to the Israelites, “Draw near and hear the words of the Lord your God. By this you shall know that among you is the living God who without fail will drive out from before you the Canaanites, Hittites, Hivites, Perizzites, Girgashites, Amorites, and Jebusites: the ark of the covenant of the Lord of all the earth is going to pass before you into the Jordan. Among you is the living God – I love this line for so many reasons. First, it’s a way too early precursor to what we read about Jesus later on (most often during Christmas season): Immanuel, God with us. And it’s in a story about Joshua, a man who has the same name as Jesus. There is irony and foreshadowing at work here, right!?! And Joshua says that this living God who is with us will drive out all these different people. So who are these different groups? Well, if you go backwards just a bit, (to Numbers) you read about how Moses had sent out some scouts to look in the promised land and see who was there. These are the names of the people groups in the promised land. And, coincidentally, Joshua was one of the spies who discovered those people in the promised land. And now Joshua is proclaiming something will happen that will prove to the Israelites that God is with them and will protect them. But wait. The thing that will prove it to them is that the Ark of the covenant, that is the very thing that people believed carried God’s presence, the sign and symbol of the covenant God made with Moses….it’s going to be thrown in that deep river water! So, now this makes a bit more sense. The priests, the ministers who are carrying the ark are going to walk the ark into the river. But when their feet touch the river the waters way upstream are going to stop, get cut off and sort of pool up into a giant hill of water. Pretty phenomenal! But God’s presence – symbolized in the ark – holds those chaotic threatening waters back. It’s a bit of a retelling the Genesis story. God separates land and waters and orders the chaos to make room for God’s people, both in Genesis and here in Joshua. Joshua isn’t the one who actually stands in the gap holding back the threat of water to let his people pass through. No! It’s the priests carrying the ark. Sure, Joshua has the vision and gives the instructions. He is the leader. But it’s the priests who are the heroes of this story. They are the heroes because they stand in the gap. Our faith is rooted in stories like this; stories about standing in the gap for others; stories about taking a risk for the sake of another person. That’s what prophets, priests, judges and heroes do. That’s essentially what Joanie and I are here to do as ministers – to stand in the gap for you, to hold hope when you can’t, to inspire faith and courage when your struggling. And that is also what you are here to do for each other! Stand in the gap. That’s what Jesus does. He stands in the gap for each of us. Jesus stands in the gap over and over again in scripture…healing people, cleansing them, forgiving them, holding back the forces of judgement and death by showing people freedom and mercy and grace. And it all culminates on the cross where Jesus makes the ultimate sacrifice – his life – by standing in the gap holding back our faults and failings, holding back our sin and selfishness – those things that would destroy us, that would consume us – holding back pain and suffering…that we might pass through them into a life of safety with God. Jesus is like those priests who stand in the gap with the ark. So Jesus is our hero. But he is more than that too. Jesus is also like Joshua, the man who shares his name. Jesus is a leader who hears God’s voice and gives us instructions. He teaches us about standing in the gap for one another. His life is a witness to standing in the gap. His stories and parables are about standing in the gap for one another, for the least of these, even for our enemy. Our calling given straight from Jesus, God’s son, is to stand in the gap to hold back the forces of this world that would destroy us so that others might pass through the difficult times into freedom and safety. 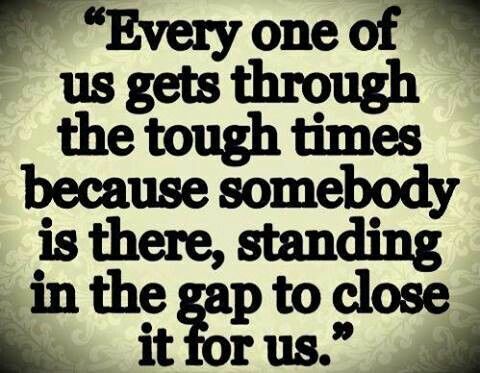 Who out there is hurting and needs someone to stand in the gap? Who out there is struggling to make ends meet…? Who out there is facing a threat bigger than they can handle on their own…? Who out there is lonely and lost and cannot find their way out of a difficult situation…? Who out there is so frightened they are paralyzed to take a step forward…? Who our there needs you to stand in the gap for them…? Whoever it is, you have an opportunity to follow Jesus and in the process perhaps remind someone of who Jesus is: our leader and our hero.